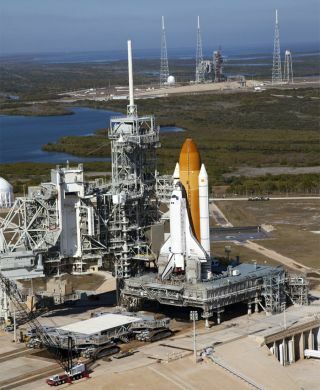 CAPE CANAVERAL, Fla. – After nearly 27 years of spaceflight, NASA's space shuttle Discovery is ready for its finale. Sitting on the launch pad, hours away from rocketing into orbit one last time, Discovery is poised to blast off today (Feb. 24) at 4:50 p.m. EST (2150 GMT) from Launch Pad 39A here at the Kennedy Space Center. On its 11-day mission, Discovery will deliver supplies, including critical hardware and a permanent storage closet, to the International Space Station. The shuttle also will ferry a new permanent resident to the station – a humanoid robot assistant called Robonaut 2. The mission is commanded by veteran NASA astronaut Steven Lindsey. Pilot Eric Boe and mission specialists Alvin Drew, Steven Bowen, Michael Barratt and Nicole Stott will also be aboard Discovery for its last flight. Bowen was a last-minute addition to the crew. He replaced astronaut Tim Kopra as the flight's lead spacewalker after Kopra was injured in a bicycle accident last month. NASA technicians will begin filling Discovery's enormous 15-story external fuel tank at 7:25 a.m. EST (1225 GMT) in preparation for the launch. The roughly three-hour fueling process, referred to as "tanking," involves filling the tank with more than 500,000 gallons of liquid oxygen and liquid hydrogen. This propellant will power Discovery's three main engines during liftoff and ascent into orbit. "We're really looking forward to a very action-packed, successful mission," Mike Moses, NASA's shuttle integration manager, said in a news briefing yesterday. This NASA image shows the shuttle Discovery and its final crew, the astroanuts of the STS-133 mission launching on Feb. 24, 2011. The final flight of Discovery was delayed several months by issues with the shuttle's external tank. Following a scrubbed launch attempt on Nov. 5, cracks were detected on several of the tank's structural ribs. Repairs were made to the initial cracks, but the shuttle's launch was repeatedly delayed to give engineers more time to determine the root cause of the problem. Discovery was rolled back to NASA's cavernous Vehicle Assembly Building Dec. 22 for additional testing. After more cracks were found, metal reinforcements were affixed to the structural ribs, called stringers, and a new layer of foam was applied over the top. NASA cleared the shuttle soon after, and for the second time, Discovery made its slow crawl to the launch pad in preparation for its final journey into space. Discovery's flight marks NASA's 133rd shuttle mission, and is one of the final three shuttle flights before the space agency brings its 30-year space shuttle program to a close later this year.